Over a month ago, I received a package of products close to my heart -- coffee. 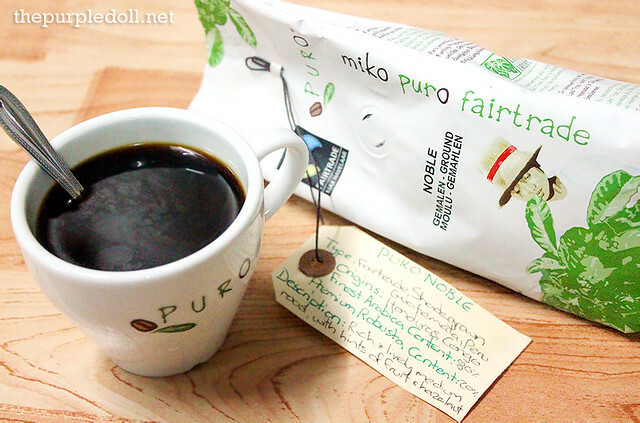 I've been a coffee drinker as early as my first year in high school, so I was very excited to try out a European coffee brand I've never had before, Puro Fairtade Coffee by Miko. Established in 2005, Puro Fairtade Coffee sources fairtrade, organic and shade grown coffee from small farmers and plantation workers in the coffee growing dependent communities of the developing world. It is a brand under Miko, an award-winning company that has been roasting coffee in Belgium for 212 years now, since 1801. 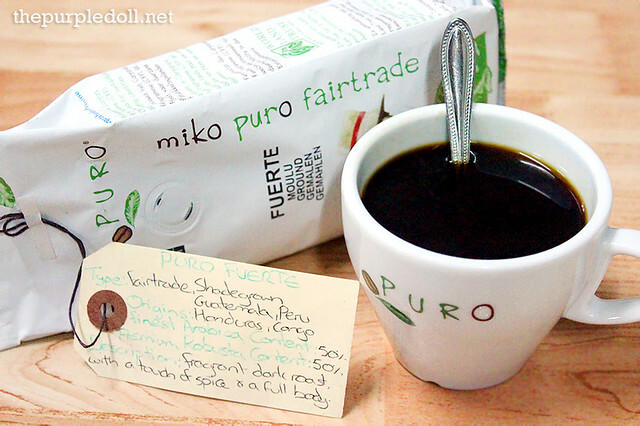 Although there are many coffee brands in the world, Puro Fairtade Coffee is exceptional at what it does. It recognizes the growing ethical and environmental awareness in this day and age, and is not at it just for profit. Aside from helping small coffee farmers, it takes a step further by helping save the rainforest. For every cup of coffee sold, money is given to buy and protect areas of rainforest in coffee producing countries in South America. To date, sales of Puro Fairtade Coffee have saved over 5,600 acres of rainforest in Ecuador, Colombia, Brazil, Borneo and Guatemala. Here is a short documentary about Puro Fairtade Coffee and its ongoing projects. It's only about 4 minutes long, so I encourage you to watch it, especially if you love coffee. Now, maybe you're wondering... Puro Fairtade Coffee sells coffee for a good cause, but does it taste good? Oh yes, it does! 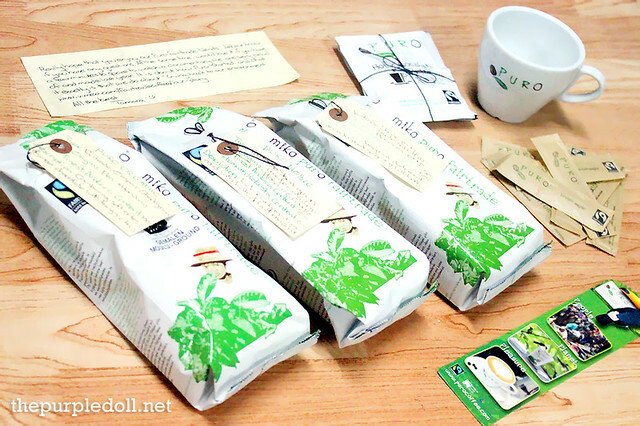 I was sent 3 blends of Puro Fairtade Coffee with handwritten labels, along with sachets of their hot chocolate and brown sugar, as well as a Puro espresso cup. And now, let me share with you what I think about them. The lightest among the blends was the Puro Organic which is made from 100% Arabica beans from Peru and Honduras. It is described as a delicate blend with soft notes of chocolate with citric overtones. Personally, I found it light and easy-drinking with fruity hints. My little sister and I can drink this even without any sugar, milk or cream. The next variant is the Puro Noble which is also available as Decaf. Made from 80% Arabica beans and 20% Robusta beans from Guatemala, Peru, Honduras and Congo, this medium roast coffee is mild, smooth and has floral notes. Among the 3 blends, this is my personal favorite as it has the perfect balance I like in my coffee, although I occasionally add some sugar to bring the blend to my preferred level of sweetness. Last among the blends is the dark-roasted and full-bodied Puro Fuerte made from 50% Arabica and 50% Robusta from Peru, Honduras, Guatemala and Uganda. This is the most fragrant yet most intense among the 3 coffee variants. I found it too strong for my liking, but I bet this is the perfect cup for invigorating the strong coffee lovers' senses. Aside from coffee, Puro Fairtade also carries other products such as teas, brown and white sugar sticks, and hot chocolate. 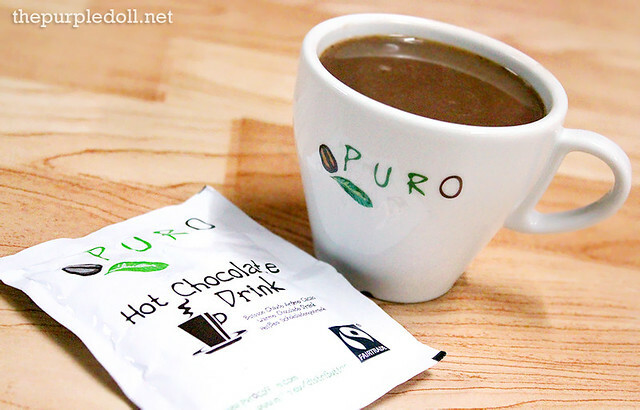 Produced by a cooperative made up of 10,000 small Dominican Republic-based cocoa farmers, the Puro Hot Chocolate is rich and creamy with a high sweetness level. Although I found it a tad too sweet for my palate, it's still a comforting chocolate drink perfect for both chocolate-loving kids and kids-at-heart. As a coffee lover, I definitely support Puro Fairtade Coffee and its initiatives. By ensuring a fair trade system, coffee farmers and workers can enjoy improved working conditions and a better quality of living. The brand's Organic Certification also makes sure that coffee is grown in the way that nature intended, without artificial fertilizers or chemical agents. With using only shade grown coffee, the brand encourages the preservation and re-planting of trees native to the area, providing the canopy of trees essential for the coffee to grow in harmony with the environment. Of course, with coffee (or any product) produced from a conscious heart, taste becomes even better. There's passion, care and heart in every cup of Puro. 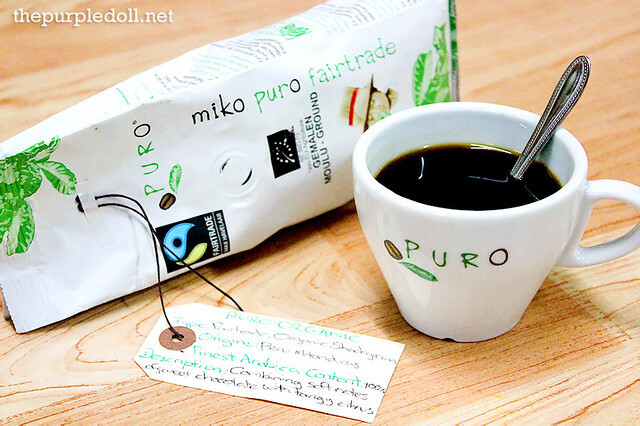 At the moment, Puro doesn't have its own cafe nor is available in supermarkets, but every National Trust site, as well as restaurants and other establishments have already been serving Puro Fairtade Coffee. If you live in mainland Europe, Africa, Australasia, Canada or Singapore, you can also enjoy Puro's products by ordering online. For more information, visit www.PuroCoffee.com and like their Facebook Page. I think that it is a great advocacy. My husband is a coffee drinker and he would really enjoy this kind of coffee. It's nice to see a coffee brand be associated with saving the environment. I hope it becomes more available in the country. I'm an avid coffee drinker (2 cups a day) so I would love this product too. I must buy more of this to save the world's beautiful rainforests. I like the concept of giving back to nature. More so that this could cut the middle man so to give back more profit to the growers. a perfect coffee to welcome and start the day..
Puro Coffee sounds and looks awesome. Hopefully, it can penetrate the coffee market at least here in the Philippines. Tangkilikin sariling atin! This is not a Filipino brand. "Puro" may sound Filipino, but this is a European brand as stated on the first paragraph of my post. It's from a Belgian company called Miko. This is nice. You're not just drinking coffee, you're also helping the environment. 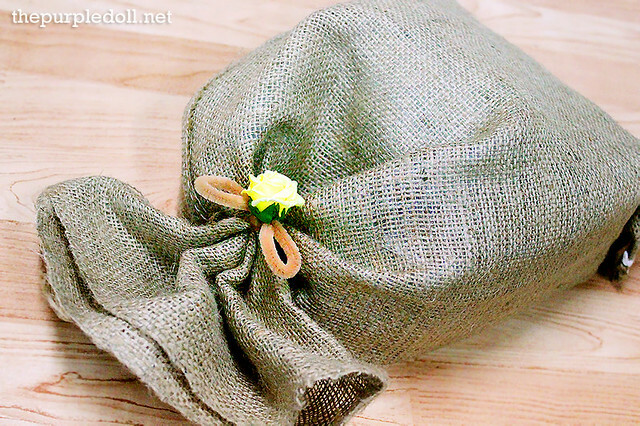 i must buy this,im a coffee drinker and i would like to help the environment. Thats what i called environment friendly coffee! That's a very nice advocacy and I would want to try their coffee! I think this is a great and helpful advocacy. Not only it promotes coffee but also taking care of nature. I love it.